I’ve been contributing as a guest to an online course run by my friend Derek Chirnside, and today we were discussing the issue of the ways in which people participate in online communities. In particular, we were talking about the different phases people seem to go through when they begin blogging. I shared with him a simple framework I’ve developed, based on my thinking and experience in this area – so tonight I thought I’d commit to putting it into diagramatic form and sharing it here for comment. My diagram attempts to illustrate how many participants in the online environment move through phases as they gain understanding and confidence. consumer – The first phase is where participants (often referred to as lurkers) simply read and explore the posts of others. Far from being passive as the word lurker suggests, consumers can be very active participants in an online community – just not yet visible to others. commentor – as this label suggests, these people make comments on others posts (either on blogs, or in discussion forums), often seeking clarification, agreeing with a statement, or offering a suggestion or link to something similar. contributor – as this label suggests, contributors are those who have started their own blogs or who initiate new threads on discussion forums. They are confident about putting forth their own ideas etc. commentator – a commentator is someone who frequently takes a ‘meta’ view of what is going on, providing a level of leadership within the community. Their contributions will often draw attention to the ‘bigger picture’, making links with other work – analysing and synthesising the contributions of others. Of course, it’s not intended to suggest that people will operate exclusively within one of these phases – there’s plenty of evidence to suggest that contributors also post comments on other people’s blogs etc. The 4 Cs are an attempt to illustrate the fact that most people appear to operate predominantly in one or other of the phases in their journey to becoming online citizens, and that there is some sort of progression that characterises this growth.In my conversation with Derek C, we spent time discussing our observation that so many of the growing number of online courses we’ve seen require students to operate their own blog, or to become active participants in an online forum. What we observe is an inevitable spread of participation, with few people actively contributing or initiating posts etc. While some of this may be put down to differences in learning style or personality, I believe that we should also be thinking about the fact that a semester long course, for example, is simply too short a time for someone who has never seen a blog before to suddenly be expected to have one up and running as a part of their course participation.What about making the reading of other people’s blogs a course requirement, or simply adding comments to the course tutor’s blog etc. as a legitimate learning activity. This would build into the course the opportunity to explore and understand the nature of the blogging experience and how knowledge is shared and developed through these interactions – before asking learners to jump off the deep end and create their own.I’d be interested to hear of what others think about this model – and how it aligns with the experience that you’ve had in online groups and communities. This comment is part of my conscious decision to become part of the online community. For a long time I did lurk or consume other people’s blogs and forum postings without having the confidence to become visible. 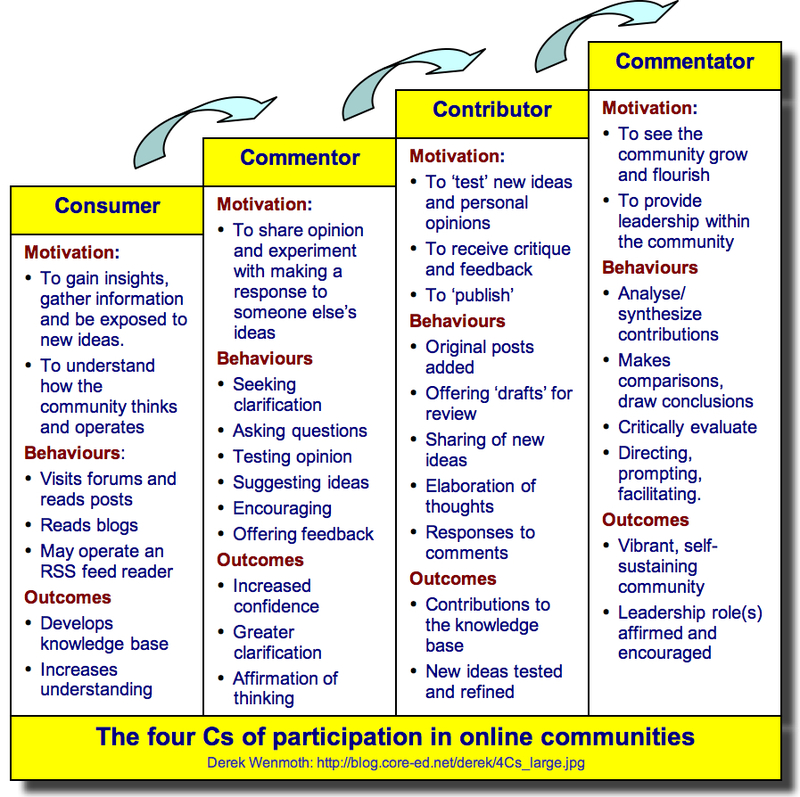 The contributor stage at point 3 almost has two aspects to it depending on the content of people’s blogging. I have started blogging as a place to collect great resources and to briefly comment on them in a manner that might encourage others. (As opposed to just book marking them on del.icio.us). As my confidence grows I am starting to post more of my thoughts and reflections on what I am learning. You are right to identify that this is not necessarility a fast process. Certainly for me it has taken time to develop this willingness to articlate my ideas on my blog. In terms of commenting and discussion through blogs I found that my participation in a couple of online communities helped and completing some online courses where forum posting was part of the requirement certainly added to my confidence with communicating in this way. I find it interesting as a personal observation that I am only now starting to feel confident enough to comment and interact online with people who I have no knowledge of other than through their blog. Your 4 stages are definitely cumulative rather than discrete stages. People commenting will also continue to operate significantly as consumers. Those who are commentating will also be consuming and contributing. As always thanks for the thought provoking posts. This post has spurred me on to be more than a ‘consumer’. I have been a lurker on your blog for several months along with several other IT/education blogs. I wondered if this means I have a traditional approach to education – ‘someone else has the knowledge’ and my learning involves finding and using knowledge rather than an active constructor of knowledge. In our secondary school teachers have been introduced to classroom blogging several months ago. None of the staff, as far as I know, use blogs or feed tools personally – This doesn’t seem to matter in terms of what goes on in the classroom. A good teacher has the skills to manage a verbal discussion. Consequently my job, as IT coordinator, has been to convince them their existing skills can be transfered to this new context. They can see the obvious benefits/outcomes of the blogging process in their classroom. So does it really matter what “C” the teacher are at? Should I be trying to change teachers’ use of these tools or should I accept the gains that have occured in the classrooms? I really like your graphic – so much so that I included it (citing the source) in an article I submitted for the Adult Basic Education and Literacy Journal. However, the editor wrote me this morning, wanting explicit permission to reprint the graphic and she needs to know by tomorrow (Friday, Sept. 5th). I didn’t see any other way to contact you (no email address on your site that I could find). So I hope this gets to you in time. May we reprint your graphic? It’s really good to know that you actually put the interaction of the people online in a graphical form. I agrre with your point that for better understanding of the online communities there must be courses like reading and commenting on others’ blogs. What I had in my mind is that this must also be mandatory that students must write their own blogs or at least at a common place where every student writes his article/blog. They can be bound to do it by making it a course or assignment work and have marks for it. It’s just a rough idea.. Very interesting to see how users of communities can be categorized. I was wondering if you also know how you can activate users to become a commentator or to move to the 'next' usergroup. Do you have any insights, or do you know any literature about this topic?